Ensuring animal health issues are dealt with effectively is very important, particularly as herd sizes become larger. Problems can go unnoticed and when outbreaks do occur, the scale can be larger. It is important to take the time to actively observe animals when getting them in and as they move through the yard and dairy. Any signs of animal health issues should be noted and followed up. Ensuring the disease is not transferred to the rest of the herd with early intervention. What does a sick cow look like? It is illegal in New Zealand to milk sick cows for food production and they must be treated as soon as possible to fulfil the requirements of the Animal Welfare Act. 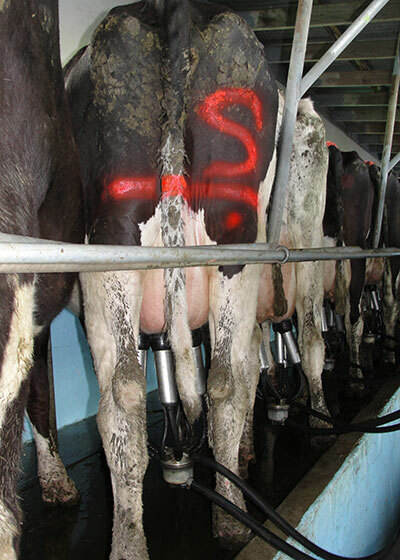 Animals showing clinical signs of, or have been diagnosed with a disease or illness, must be removed from the main milking herd, marked and recorded, and their milk withheld from the bulk milk tank until the clinical signs have been resolved. Prompt treatment of sick and lame cows is best for the cow’s welfare and will also mean there is less of a drop in milk production. Recording the cause of lameness is an important part of prevention. How can I safeguard animal health? Ensure that your farm systems and training are set up to safeguard animal health. protocols around teat disinfection as part of the milking routine. milking hygiene to prevent cow to cow transfer. recording and monitoring of infected animals. To prevent the transfer of other infections between stock, protocols dealing with the segregation of infected animals and the quarantining of new stock are important. It is best if treated cows are run in a separate herd. This does not mean running them with lame cows whose milk will be going for supply. If running treated cows alone is not practical, then they need to be drafted out and milked last when the delivery line to the vat has been disconnected to prevent cross contamination. Do not milk them first. Ensure they are clearly marked. Ensure the paddock they are in is secure. Preferably the water trough should be away from main race. Try not to walk the main herd past prior to milking. Wait until the main herd has left before the treated cows enter the platform. Consider holding them in a separate small yard while the main herd is being milked. This will also allow you to check that all are present and correct at each milking. Use stock paint on udders and/or coloured tape on back legs or tail. If there is one quarter which is the problem, mark that quarter. Renew markings regularly. Any cows that are prone to repeat clinical mastitis infections should be more permanently identified so that they can be checked more frequently. A leg band is a good semi-permanent ID for 3 titters and slow milking cows, but can be hard to remove. Number the bails in rotary dairies – this helps with communication between milkers, particularly if ear tags are not easily visible. A problem cow is any cow that needs to be identified for special treatment. Problem cows might include cows treated with drugs, or high SCC cows, cows to be drafted for herd health procedures or AI, cows that impact on the milking routine - three titters, colostrum cows, kicking cows or slow milkers. Increased milking efficiency - by making sure problem cows e.g. those to be drafted or treated, are not missed at milking. Maintain milk quality - by ensuring the milk from cows that have been treated is withheld from the vat. Clearly visible spray paint alerting milker to a treated cow. It is critical for milking efficiency that these cows are easily identifiable by all milkers, particularly if their milk must be withheld from the bulk milk tank. It must be clearly visible and alert the milker to the presence of a treated cow. Durable and visible in all weather conditions. All milkers must know and understand the system - display the markings in the dairy somewhere so people know what each marking means. The system must be able to be removed or cancelled once the cow is clear. Colostrum and treated cows must be marked differently. Uses two marking systems just in case one fails. What marking system is best? Accurate recording of all animal health events is important for timely identification of disease outbreaks, identification of cows for culling, effective management of sick cows, information for your vet and design of preventative programs. Monitoring this information allows any increasing levels of disease in the herd to be identified early and managed, which is particularly important for larger herds where small and subtle changes can quickly lead to significant effects. Make sure there is a designated area in the dairy where this information can be recorded. condition/disease and veterinarian (if consulted). the type of treatment (including dose). the date of each treatment. the date that milk re-entered the bulk milk tank. Whatever system is used, written records are also required. This is particularly important for any cow that has received treatments or remedies as it is a requirement of the New Zealand Food Safety Authority. 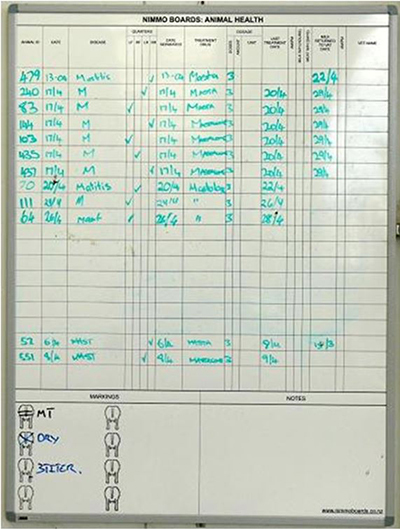 A clear list of all problem cows displayed on the wall within sight of the milker will save time and prevent mistakes. If you use a white board make sure you keep the information somewhere else permanently, i.e. take a photo of the board and transfer it into your records. Disease detection can be difficult and cases are sometimes not detected until later in the course of the disease. Farm staff must have training in ‘cow signals’, for example, how to identify early signs of lameness, teat damage and mastitis. more than 15% of your herd have a SCC above 150,000 at any herd test. Talk to your vet about best practice prevention and management of dairy cow diseases. In many cases they can provide resources and training. Don’t forget the PAR (Prescription Animal Remdies) vet consultation that is a legal annual requirement. Many vets now also provide Herd Health Management Plans for farmers that look at prevention, identification, management and treatment of animal health issues from the start of the season. Watch our brand new animation on correct use of hip lifters.